There are many ways to retouch skin, too many for us to teach, but in this tutorial I’ll show you the most popular ones and you can combine them using non destructive editing techniques, in order you can go back and readjust the settings in any time. To follow this tutorial, you'll need Photoshop CS2 or a newer version. Use Yellow channel to reduce skin flaws quickly. This is a good technique to reduce freckles, wrinkles and blemishes if you don’t have a lot of time. How to clone out wrinkles and blemishes on a separated layer. A professional airbrushing technique it is popular in the advertising industry, they use this to make skin look perfect without making it look plastic or blurry. Easy trick to reduce skin discoloration and oiliness. Using dodging and burning to manipulate the shape of the face without wrapping for liquefying any parts. 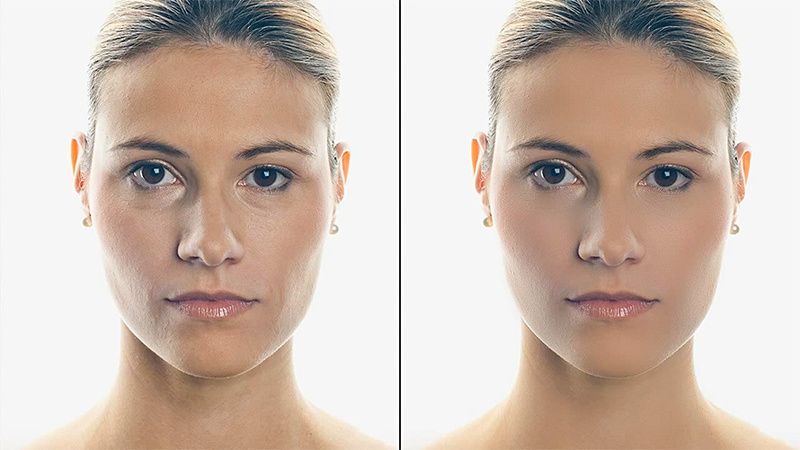 Once master you can combine any or all of these five techniques to get anything from natural looking skin improvements to perfect looking airbrushed skin. To follow this tutorial, you'll need Photoshop CS2 or newer.